Jan introduces her first quilt, a calendar quilt, started as part of a quilt class and features a variety of techniques including hand and machine stitches. 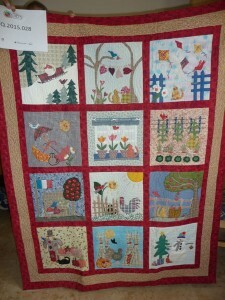 She talks about making the quilt, as well as the meaning behind the different blocks and fabrics. Jan has got some of her family quilting and describes some of the quilts she’s helped them to make. Karen Philpott [KP]: This is a first interview with Jan Viner; ID number TQ.2015.028. And this is Jan Viner at Crieff being interviewed by Karen Philpott. Jan Viner [JV]: Alright Karen. KP: Do you want to tell me about your quilt? KP: What did you use to print with? JV: I think it was a rubber stamp ’cause I had been… I used to make cards and I used to use rubber stamps quite a bit, so it was quite nice that I could incorporate that as well. And… of cause I got so far with it and then I didn’t know what to do. Class finished and I didn’t know what to do with the quilting but some blocks are hand quilted and some blocks are machine quilted. So that’s… and what I liked about doing this one was I could put in things that meant something to me. For example, you’ve got the [microphone noise] French flag there because at the time or just a year before that I started quilting, I was still teaching and I used to… every year I used to take a group of children cycling in France. So that was… I really enjoyed having that little bit in. And, er, [background chatter]. KP: Is… is there a favourite part of the quilt that you like? JV: The favourite part, erm, no I don’t think… there isn’t, oh I did like… I did like the cat on the sledge [laughs]. It seems a bit strange to say that but, er, I did like the cat on the sledge. And the other thing… oh the… before I started quilting I used to do sort of household sewing and I used to go to a… through my school contacts [microphone noise], I got in touch with a place called Croftmill and they used to get bags of fabric sent. And the backing for this was from Croftmill so that was a reminder of my school days and it reminds me of all the people that I knew when I was teaching so it was… that fabric I’d had for a long, long time. But then, I needed something for the, er, borders and I didn’t know what to do so I actually, by that time, I had discovered, erm, Country Threads in Bath so I took my blocks to Country Threads and we laid them out and then they found me this red fabric which tied the whole thing together which was very exciting when that came together. KP: It is ’cause there’s a lot of red in it isn’t there with the birds and the kites and the hearts. JV: Yes, yes. And then the… the middle border that was some fabric that I bought on my first trip to America. This was again after I’d retired and my first year of quilting and I think it was from a shop called Darleens in San Francisco [laughs]. It was a little… little shop and of course it was practically nothing but I thought ‘oh that will… they’ll just finish that quilt off’. So it’s all those little, erm, not direct memories but… oh and I think there’s some … oh yes there’s the plaids. That was before I had moved to Scotland but every time I did come to Scotland I used to go to Kings in Perth and buy a little bit of plaid fabric because at that time they used to sell plaid cotton. I don’t know if they still do or not… but, erm, I think there’s a little bits of… only a little bit of plaid, but it’s there so that’s… the Scottish. But as I say, this was all before I had very much fabric at all. KP: And how long did it take you to make? KP: And did you name it Felix Rules? JV: Yes, yes it was actually… I’ve forgotten what it was … it was called Friendly Foes, is the actual name of the pattern. JV: Felix is the cat. JV: No, no it wasn’t my cat. I didn’t have cats at the time, oh I had a cat called Buttons at the time but not Felix, but I think she used to have Felix cat food. So [laughs] that was… that was Button. KP: And what did you use the quilt for? JV: I just had it on the wall, yes, I didn’t use it for anything else, just on the wall. And as I say it has… it did fade badly because it was right in front of a big picture window looking over Torbay. And the sun used to come in when we get sun in Devon [laughs] and so it faded it. But, er, it was up there for a… for a quite a while. But when we moved I’ve never had a wall big enough. There’s a little bit more plaid there. KP: You’ve used quite a lot of different techniques on it. KP: What are some of the techniques? JV: Some, well obviously there’s different kinds of applique but Jean was very good on her applique or applique. So some of its just needle-turn and hand-down, some of it’s with bondaweb and buttonhole stitch. KP: When you say needle-turn, how do you do that? JV: Erm, when you have the edge of the… you have two pieces of fabric, one over the other, and then with the edge… your needle you just turn under the fabric and then just stitch it down with a small stitch, well hopefully a small stitch. KP: Yep, and the stitching around the ones with the bondaweb? JV: Yes that’s a… I think that’s buttonhole stitch, yes it’s just a long time since I did it. But that was… that was I think, I don’t know if that was buttonhole by hand or buttonhole by machine. Oh I think that’s buttonhole… oh no that’s buttonhole by hand. That’s hand done buttonhole. KP: Have you got some that you did by machine? JV: I’m not sure if I have on this but I have got satin stitch by machine. KP: Do you like doing the satin stitch? JV: Oh I love doing the satin stitch by machine. And that was probably one of the first times that I did it, erm, you know, with the feed dogs down. And then I did all different kinds of quilting on it because I… I really … I was just experimenting. KP: When you say the feed dogs down. KP: Is that the free machining? JV: Yes. Free machining, yes. Yes. KP: So that means you can go…? JV: Yes you can go in any direction because the, erm, fabric is not being held by the… by the feed dogs and it’s not being fed through the machine. So it’s like drawing but moving the fabric instead of moving a pen or pencil. And I’ve got some, er, built in embroidery stitches the… the patterns that were built into the machine but I’ve also got some hand embroidery on it. I just really was just threw everything at it [laughs]. JV: But, er, I thought to myself, well if I can do that anybody can do it. Oh this was my least favourite square because it had points on it and points, if you’re doing points in applique, the first time I found it very difficult. KP: And is this needle-turn as well? JV: Erm, yes those points were needle-turned, not very well but they were done. Yes so it was just a case of tucking it under with the needle and you can see here where I was going round a corner and it frayed, so I had to do a few extra stitches to keep it down. But I was so excited with the whole thing [laughs], I was like a woman possessed. Oh and there’s some more of the buttonhole stitch that was, erm, that was again free machining I think. And that’s embroidery but oh and that again is done with the machine. KP: And has any of this got padding underneath the fabric? KP: And then stuffed… is that like the apples on the tree that have got that…? JV: Er, yes they’ve got the stuffing… stuffing in them but they’re… they’re not actually boutis because boutis you have… it’s one fabric with a pattern on it. But that’s an applied… but it is a similar sort of effect you get the stuffed… stuffed bit. JV: So what do you then go on to do after this quilt? JV: Well simultaneous with that quilt I was doing, erm, the sampler quilt and I really was… I wasn’t really doing anything on my own at that stage. I was just doing what Jean was doing in her classes so I went to the classes for [microphone noise] several years. And so… after the sampler quilt she was doing African quilts so using designs that came from Africa and fabrics that came from Africa, so I went big time into Africa and African fabrics [laughs]. KP: And did you visit Africa? JV: No [laughs], not yet. Yes I like that, not yet but that… that was very interesting and it was … there were two different strands there. There was the African African and then there was the European’s view of Africa. 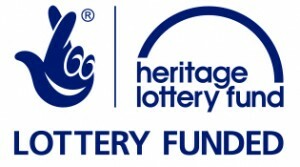 So some designs would be like a picture of an African village and other designs would be based on the symbolic things of Africa itself and the symbols they used. KP: And which one used the symbols? The Africans or the Europeans? JV: The Africans would… because it was based on there’s, but Europeans would obviously use them in their quilts because I did a quilt and used the symbols for the quilting, that sort of thing, so that was good. So I did one called African Wedding because I was obsessed with the double wedding ring back then [laughs]. Only a small… I only made a small one but I used the African fabrics and that was… it’s all, yeah, I was like a mad woman [laughs] starting anything. I couldn’t believe it. KP: And did you always finish everything? JV: [Laughs] now that is the most silly question I’ve ever heard [laughs]. No, no I didn’t. This is why I didn’t have many to show you because I haven’t got many that are finished [laughs]. Well, all the finished ones have been given away but I… I worked out when I moved here that if I worked eight hours a day quilting it would take me nine months to finish all my pieces that I’ve started. Because the trouble is that once I get into one quilt it leads to another. And I’m not… whereas my sister she only ever buys the fabric for the quilt she’s going to make and she won’t do anything else until she’s finished that quilt. And as a result she makes some absolutely beautiful quilts and they’re all finished. But, er, but [laughs] I don’t finish much. To begin with, it was… like my sampler quilt, it was bigger… it was the biggest one I’d done, it probably still is the biggest one I’ve ever done. But what I was doing outstripped my skills and my knowledge at the time. So I wanted to machine… I did want to machine quilt it, I didn’t want to hand quilt it but I didn’t know how to get it all under the machine. 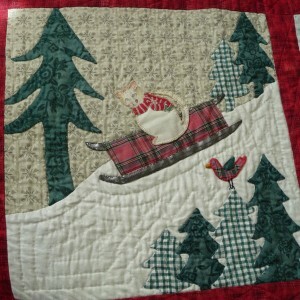 So I ended up with a compromise by hand quilting the blocks and machine quilting the borders which I did this year so. KP: And have you… do you still have that quilt? JV: No that’s … I’ve given that one to my daughter. And I started that… that had a … and because my motivation to finish it went because I was making it for her, this is like 15 years ago, and I was making it to go in her bedroom with her colour scheme but then she changed her colour scheme so the quilt didn’t… no longer fitted. But this year she’s gone back to that original colour scheme [laughs] so I thought well I’d better finish it quickly before she changes again. KP: So it’s finished and she’s got it? KP: And does she use it? JV: Yes it’s on her bed the whole time. That’s why I couldn’t bring it to show you because she wouldn’t let me have it. She’s waited so long for it [laughs]. KP: And does she quilt, your daughter? JV: She doesn’t… she does sew but as yet she doesn’t… and she does felting but she… as yet she doesn’t quilt. I haven’t got any daughters that quilt. KP: But you’ve got a niece? JV: Yes, I’ve got a niece and she’s just started and she’s just over the moon. And she said to me, she said I can understand now why you’ve got so many things unfinished because now she’s started she said I’ve got so many ideas in my head I don’t know, you know… I really want to get started so she… I said well just try and finish one first [laughs]. KP: She started with some fabric of your sister’s? JV: Yeah, that’s right, yeah. 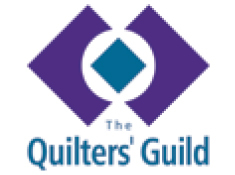 My sister died three years ago and she was a… used to do a lot of sewing and craft work but not quiltmaking. But she was going to do a denim quilt or a denim throw and so she started collecting all the jeans and denim things that she could, denim skirts plus some checked shirts and she cut out 6½ inch squares. I gave her a little 6 ½ inch square ruler so she’d cut out a pile of these and there were about 80 of these squares left. Erm, my niece said, oh I’d really like to use those denims that my mum left because I know that she was very keen to make this little throw. So last… week before last, we got started on it and so [Dodo?] now the last text from her, she was just saying she’s putting the panels together. KP: And which pattern did you use? JV: We decided to… well I decided… I decided [laughs] ’cause she didn’t know. I thought it would be easier to do a nine patch which means you have … you take nine squares all the same size, well this is if you’re doing a traditional one. And four of the squares are in either one colour or one style or one shade either light or dark. And then five squares are of a different colour but it could be that one the light and the others are dark, one are red and the others are white, anything like that so. Or you could have four of each and a different one, a feature one in the middle. So I thought well, it’s going to be quite difficult to get all these squares into some kind of pattern so we’ll make nine patches. And we counted out the squares and we thought we had to actually cut a few more squares so at that point I introduced her to rotary cutting and she cut another seven or eight squares. So we then had, I think it was probably about 81 squares, would that be right? Nines, nine nine… no we had one, two, nine squares, yeah that is… it is 81… 81 squares. My maths is going. So we got our… our 81 squares and we made up the nine patches, had them on the floor and I said, now we can try and balance it. So we took one square from here and changed it around and then she said, well I’m not happy with it, she said I didn’t think it’ll be this difficult arranging them, she said it’s fun it’s difficult and the centre’s not right, I don’t like the centre square. So I heard a noise in the next room, we were the only ones in the house and I went into the dining room where we’d got the machine set up and on the table was a little plaid square with a pocket in it. And she said, oh that’s my centre [laughs] so she put this in the centre and it was just amazing. She said, my mum put that there for me, so. KP: That really means a lot. JV: Yes, it does mean a lot to her because she was very dependent on her mum because she had these two boys that were autistic and her mum used to help her with them. So that’s a lovely memory for her and, er, as I say, it’s her first quilt [laughs. JV: And it… it’s very interesting because she texts me most days now to tell me how she’s getting on with it. And I sent her instructions for laying up and binding and she said, I’ve been watching it on YouTube and I thought that was marvellous that she could do that because it wasn’t around when I started. I just got cupboards and cupboards of books but yeah, so she’s been watching on YouTube so. KP: Good, and your granddaughter? KP: And how old is she? JV: She’s 12… she’s 12 now, she was only 11 when she was doing this when she started. And I was astonished because the moment she sat at the machine, she was … like she was born to it. You know, quarter inch seams, all straight and all the corners matching [laughs] because that’s one of the things in patchwork that sometimes you don’t realise that when you’re joining your squares that it’s nicer to have the squares all coming together in one corner. So, erm, she did that cushion and then she wanted to do a different one for her Dad so I said, ‘well how about doing him a circle with different wedges in it’. So we cut out all the triangles and she chose the Christmas fabric ’cause it was a Christmas present and she stitched these altogether and made this lovely cushion and her Dad was thrilled to bits with it. KP: I should think so. KP: So you’ve almost gone back to teaching. KP: That’s where you get your inspiration from is it? JV: Yes, yes or a friend or, you know, if I might be looking in the flowers and think, oh well that’s nice I’d like to do something with that or photographs. And my… my all-time favourite was I made a collage quilt, I think it was for South West Quilters. Yeah it was it was for South West Quilters, erm, not a competition but a challenge and I can’t… I think it was something to do with welcoming to Devon. And so, I thought I’d do this quilt based on… for the years that I’d lived in Devon because I’m not originally from Devon. And, er, and so I had that just started with a tree and the, er, branches holding out like hands saying Eden Awaits. And then I had all different patches on it with different facets of my life so I had, erm, I had my bicycle, I had a photograph of my bicycle and I… and I cut it out and stitched it down and I had pictures of my gran… by this time I’d got into pictures on fabric. And I had pictures of my grandsons in the sea so I put them on a… on a patch with… they weren’t regular patches it was just like a collage. And, er, I did have a little dog on the beach although I didn’t have a dog at the time. KP: That was a wish [laughs]. KP: And did you finish that quilt? JV: I did, yes that’s only my wall [laughs]. I had that one, so I have that on the wall still, so that was good. KP: Before when we were talking, we were talking about the different changes you’ve had over the last few years. KP: And I wonder how the quilting has helped you with… with those changes. JV: Yes it… it’s… they’ve been a help for the changes because they’ve provided a thread and I find that when I’m making a quilt I seem to work through the changes that are going on in my head. So to interrupt them sort of in fabric, er, which is… probably doesn’t notice on the actual quilt, but it’s the process of making the quilt that I like. I’m not actually that interested in the end product, I love to see the end products of other people, but it’s the process of making of the quilt and all the different things that happened. Erm, we had a… when I was in… in Devon I actually had a caravan and, er, we used to go to this caravan and make a square each time I was doing it, applique dogs and I eventually gave that little quilt to my granddaughter and, er, that was, erm, it was diff… for my daughter who was having a very difficult time at that moment. And I was trying to think of things that I could do to help her, you know so she came to the caravan as well. And then moving up to Scotland was a big change and, er, when my husband… when we were in Devon and we had, erm, a split level house and he was starting to get arthritis and couldn’t move around so much, I thought well we’re going to have to move to Paignton where it’s much more level than Brixham. So, er, I forgot what I was saying now [laughs]. KP: Talking about how quilting has helped you, you concentrate on the process. JV: Yes, yes, and, er, making the… having to move from where I was, was… was a big upheaval, erm, to move from a sea view just to a smaller property with no sea view. But I could do that, so I could make my sea views in my quilts [KP: Ohh]. So… so that was… that was quite nice. Er, I did, erm, yes… in the collage quilt I had, erm, a sea view in that. It was actually the… along the Jurassic coast and Durdle Door, I don’t know if you know Durdle Door but it’s a little rock formation of the Dorset coast. And that’s my… I got a little sea view there which I took from a photograph and chopped it around and then made patterns of it. So… so that was… that has helped me come to terms with not having a sea view and in actual fact I haven’t missed it since then so that was good. And, er, the thing like with my sister, the… the one that died, you know, having her little pieces to finish. I have told all my relatives that under no circumstances are they to attempt to finish all my unfinished items when I’m gone. I said, ’cause if I couldn’t do it why should they [laughs] but only if they really love the thing and they want it [inaudible]. But this was slightly different as she, er, wasn’t really ready to go but there you go. Erm, yeah so that… that sort of thing is helping her… her daughter come to terms with it although she’s lost her mother three years ago now. KP: It’s, yeah, it’s helping with the treasuring of the things that her mum had. JV: Yes, it is, it is, yes it is. So it’s like… it’s like a life story in a way so it’s… but it’s also it’s this quest for knowledge, to find things out and it’s just amazing. Like you think, erm, something a Japanese way of doing something and then I can’t just stop at that, then I have to go into the history and geography of Japan [laughs]. KP: Do you mean the folded? KP: So it’s never going to stop? JV: No, no I don’t think so. The… the only… I have slowed down a bit because when I moved up here I had, erm, a few months doing horrible things like making curtains [laughs] hideous, but they had to be done. So I made the curtains and then I got the dog so I spent a year just playing with the dog. And, erm, just… and then I got started on doll making and I can’t quite remember how that… that happened. I think it was another… some other classes where I used to go for patchwork and then they said they’d got this American teacher coming who made dolls. And somebody had dropped out so would I like to… oh I don’t mind, I’ll go, I’ll do anything. So and of course then I got a bit obsessed with the dolls so I’m doing the dolls at the moment. So the quilting’s sort of on the back burner perhaps slightly. JV: No I don’t think we’d better go down into that. JV: Yeah. And, er, I’ve got… the quilt that I’m currently working on which will get finished is for my grandson who’s moved to Australia and it’s… I started it before he went but its all triangles. Again, they’re all… half of them are tartan and half of them are a solid colours. And, er, so I promised him I would finish this for him so I will. So I’m just doing the quilting on that now by machine, that will get finished but that’s my latest one because sadly his mother died when she was 30, that was my daughter and he was only six at the time. And she used to do a lot of sewing, she used to make… and she had a little business going where she made dresses and things. But, erm, so I’m sewing all these triangles together, I think ‘well this is one for Solomon, Nancy’. [Laughs] you couldn’t do that one so, but at the time when she died I wasn’t in quilting which probably would… I was working full time but, er, yeah so that one will get finished but, er, I don’t know if I should start any bigger ones after that. Probably I like doing the wall-hangings so I’ll probably stick with that. 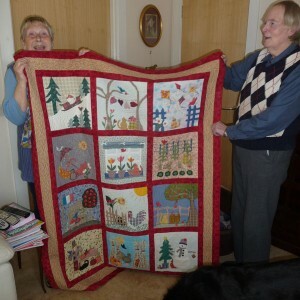 I’ll let my Cornish sister do my bed quilts [laughs] and I shall do the wall hangings. Yes that’s where we are so far. KP: Good, so we’ll finish there. JV: Yes, a bit ramble I think.